The Musi River is the longest river in Sumatra Island. This 750-km long river is famous as an important international harbour at the era of Sriwijaya Kingdom. Tourism destinations that can be found nearby the river are Sultan Mahmud Baddarudin II Museum and Boom Baru Harbour. The river flowing from Kepahiang District, Bengkulu Province separates two cities, Seberang Ilir (north) and Seberang Ulu (south), in Palembang City. Nine tributaries - Komering, Rawas, Batanghari, Leko, Lakitan, Kelingi, Lematang, Semangus, and Ogan rivers flow to the river. Crossing the river using traditional boats can be alternative for those settling in Palembang City. Taxis (motorized boat) are easy to find along the river. Watching the beautiful scenery of sunset at evening is great experience. Likewise, you can enjoy romantic night enlightened colourful lamps around the river. Many visitors come to the river on weekend and holiday. 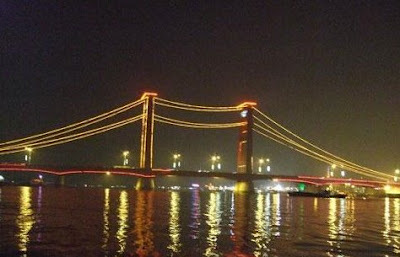 The Musi River is a well-known tourism destination in Palembang City, South Sumatra Province. You can find a traditional house typically South Sumatra Province namely Rumah Rakit that is built upon the river. Some special festivals like Festival Air is usually celebrated around the river. Many attractive competitions such as bidar (boat tournament), boat-decorating contest, and swimming tournament are held during the festival. The Musi River is located in the heart of Palembang City, South Sumatra Province, Indonesia. To reach the destination, you can take public transportation from Sako Kenten bus station to Ampera or Pasar llir 16. You only need to pay about IDR 1.500 to IDR 5.000. And you can take pedicab typically Palembang with IDR 5.000 – IDR 10.000 for its cost as well. There are many hotels around the Musi River with various costs ranging from IDR 250.000 to IDR 5.000.000. For you who want to taste Pindang Ikan Patin, special food typically Palembang, you can find many restaurants along the riverbank and some of them, likewise, are built upon the river. Food stalls selling various souvenirs typically made in Palembang like Songket, Kain Jumputan, and handicrafts are easy to find there. Moreover, you can also find Kerupuk Palembang sellers there. For you looking around the beauty of the Musi River, you can rent their speedboats with IDR 50.000 to IDR 100.000 as its costs.